Recently, I’ve been back into home building and completing a long overdue manuscript. These posts are intended to both keep me sane and further the cause of procrastination. In addition, I hope to sharpen my GIS skills and reduce the amount of time it takes to produce some interesting maps. “The ‘index of dissimilarity’ is a demographic measure of the evenness with which two groups are distributed across the component geographic areas that make up a larger area. The index score can also be interpreted as the percentage of one of the two groups included in the calculation that would have to move to different geographic areas in order to produce a distribution that matches that of the other group. The index of dissimilarity can also be used as a measure of inequality. B = the total black population of the large geographic entity for which the index of dissimilarity is being calculated. W = the total white population of the large geographic entity for which the index of dissimilarity is being calculated. Basically, it is the difference of the percentage of each group in the census tract relative to the larger metropolitan area in this case. From the map, it’s clear that while the South has it’s share of segregation, the worst separation of racial groups exists in the industrial midwest along Lake Erie. This is, of course, no surprise. 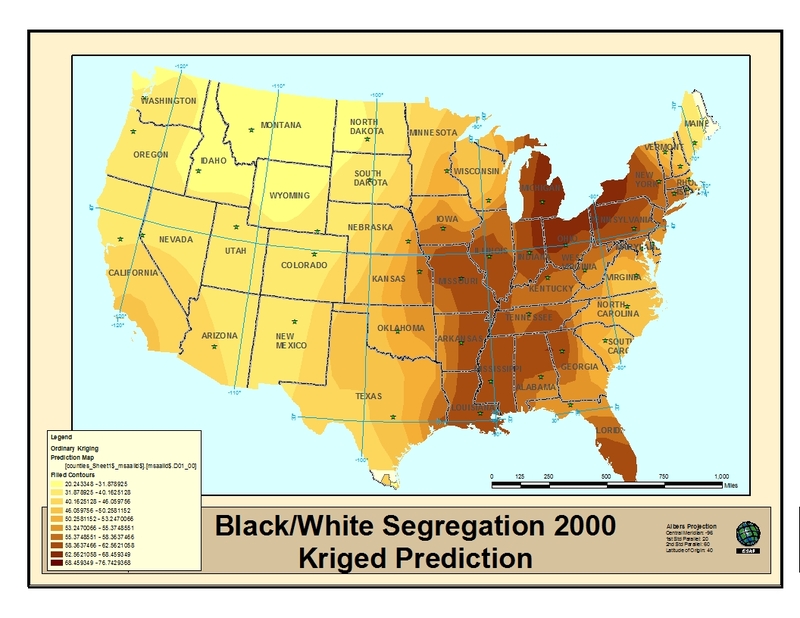 It has been long known that Michigan is one the most segregated states in the Union. 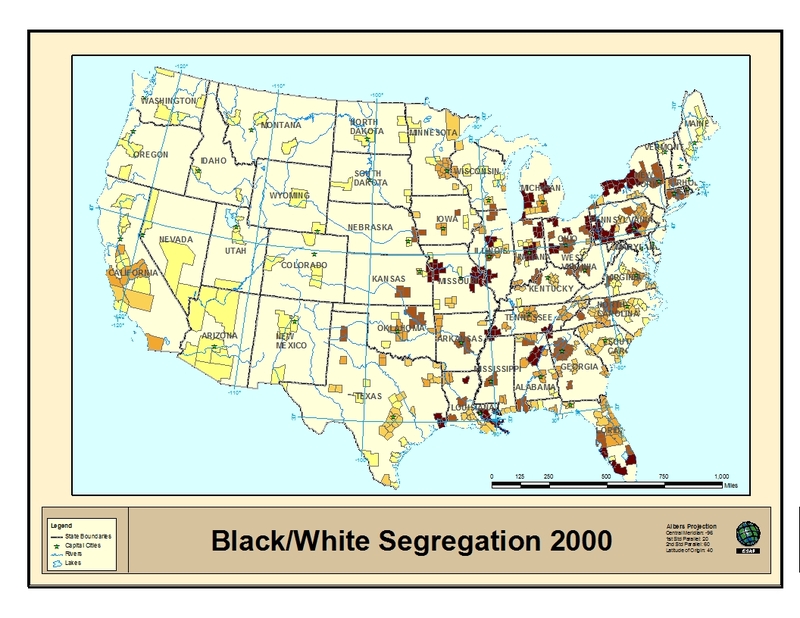 Segregation also appears to run rampant along the Mississippi river, mostly concentrated in Memphis and St. Louis, MO. 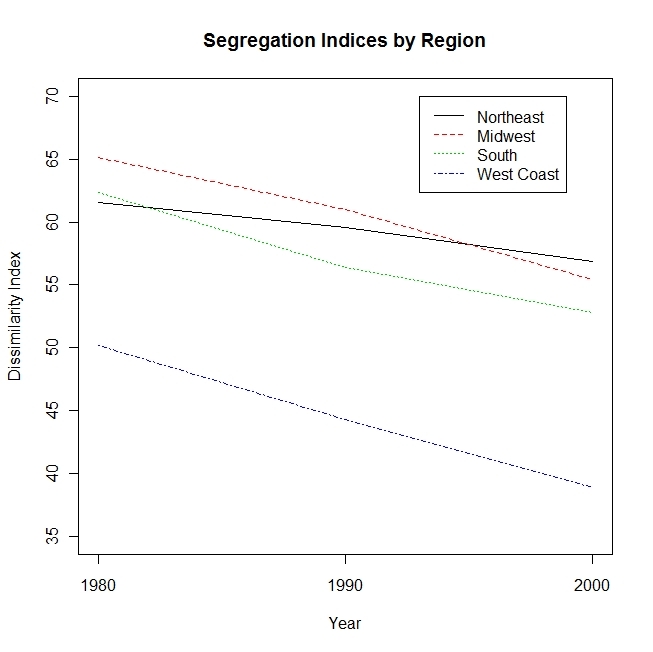 Overall, Black/White segregation levels improved from 1980 to 2000 in all regions as can be seen from the table and graph below. The West Coast region appears to have the lowest level of segregation and the Midwest competes with the Northeast for the title of the highest level, which really isn’t all that far off from the traditionally segregated South. Where people choose to live is obviously not an issue, but segregation in the US is more than race/ethnic groups opting to live in communities of like minded individuals. It is the result of decades of bad policy decisions which restrict movement of economic groups to specific geographic areas, which serve to exacerbate economic and social inequality. This, if course, has grave implications for the ability for groups to represent their neighborhoods in politics and results in the unfair distribution of health, educational and economic resources, as we all know. It is also important to note that African Americans are not the only marginalized subgroup in the US. We could easily perform this analysis for Hispanic groups, Asian groups and poor whites and potentially produce similar results if we are to assume that a large proportion of segregation in the US is driven by economics. It is apparent that, given Rand Paul’s recent brainless comments on the overextension of the Civil Rights Act of 1964 in the realm of private business, that this issue is not only relevant, but important. Some private businesses, if left to their own wiles, would pick and choose it’s customers to cater to wealth subgroups and further marginalize poor individuals and thereby make the problem of lack of access to resources in the US worse than it already is. It is worth mentioning that the United States has been said to be at least as segregated as apartheid era South Africa, which is a sad comment on the nature of American society. Although very difficult to prove without some counterfactual referent, we can potentially attribute at least some of the decline in the overall levels of segregation to good policy decisions such as that of the Civil Rights Act of 1964. Mr. Paul and his cheap, double talk style of campaigning would do right to recognize the importance of government for setting societal standards which create opportunities for all.